Admission to the OCBC Skyway with aerial views of the gardens is S$5 (USD4) for adults and S$2 (USD2.50) for children. Visitors can also tour the gardens via the Garden Cruiser boat which costs S$5 (USD4) for adults and S$2 (USD2.50) for children. Singapore citizens and residents receive discounted rates to the conservatories. 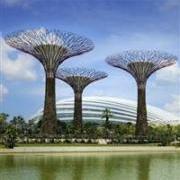 The Gardens by the Bay is the latest development in Singapore’s scenic Marina Bay area. Covering over 100 hectares, the gardens include attractions such as a Chinese Garden, cloud forest conservatory, flower dome, dragonfly and kingfisher lake, and educational exhibit called World of Plants. Inside the garden is a new celebrity chef restaurant called Pollen serving contemporary European cuisine. Visit http://www.gardensbythebay.com.sg/ for more information. The gardens are open from 9am – 9pm daily and tickets can be purchased on site.